In January 2014 London based curators Patrick Morrissey and Hanz Hancock staged an exhibition entitled ‘Crossing Lines’ at the independent gallery space &Model in Leeds city centre. The exhibition centred on UK artists working in the field of geometric, reductive and systems art and was spread out across three floors of white wall gallery space. In May of that same year Morrissey and Hancock contacted BasementArtsProject to express interest in staging an exhibition here. Being familiar with their previous Leeds exhibition and the remit of their work as both artists and curators I was curious to find out how they would possibly adapt to a space such as BasementArtsProject. The idea that the kind of work on display at &Model would be in anyway appropriate at BasementArtsProject would on the surface seem unlikely but we decided that it would be interesting to discuss the possibilities. Over the course of the next few months Morrissey, Hancock and colleague and artist Sarah Sparkes made site visits to Basement and plans were laid down concerning how a project might work. Come the dark, post-Christmas lull of January and the work arrives by van from London containing works by Hanz Hancock, Patrick Morrissey, Charley Peters, Giulia Ricci, Sarah Sparkes, Andy Wicks, Ben Woodeson, John Workman and from Leeds WalkerHill; the collaborative partnership of Michael Walker and Martyn Hill. In terms of artists Morrissey, Hancock and Ricci are the only intersecting points between Crossing Lines and Other Rooms, yet the deep vein in this particular strand of artistic endeavour is once again very much in evidence. 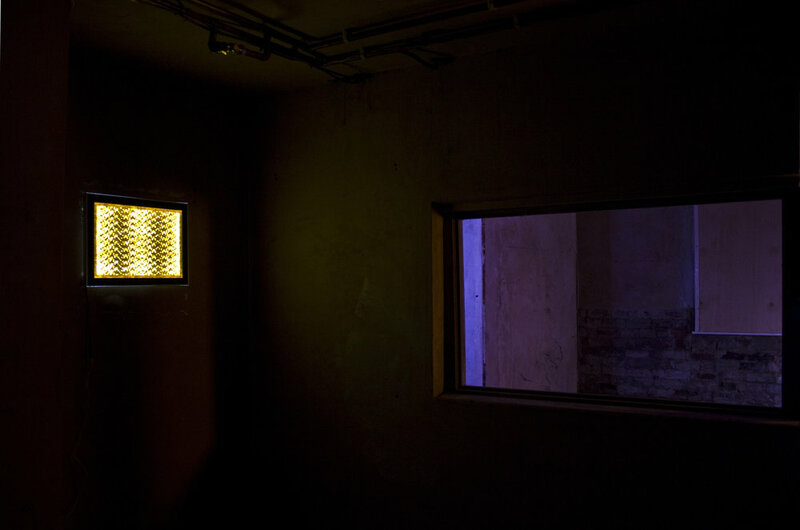 Under the rubric of Saturation Point, Morrissey and Hancock’s online editorial project, the brief for the exhibition is to utilise and work with the subterranean atmosphere of BasementArtsProject. Gone are the clean white surfaces and bright lights of &Model, replaced instead with the dank corners, crumbling plaster, exposed brickwork and cobwebs of a turn of the 20th Century Basement. In the gathering gloom of this domestic environment the assembled artists have created works that not only create playful visual interactions but also emit their own light sources. In a month marked out by its darkness and the dubious accolade that it contains the most depressing day of the year, an exhibition displaying such lightness of spirit and tone seems like a prescient move. All of the works on display are sculptural in their nature and in their remit work as explorations of surface, depth and dimension, even in the case of the digital works presented as projections or on the various types of screens in use. The dialogue here is between surface and depth and the tensions between. There is a sense in which the artworks could be seen purely as exercises in surface but such classification is not possible due to the fact that, for the two weeks of the exhibition, they have become integral, by design, to the space that they inhabit. All of the works presented have been created specifically for the purpose of this exhibition which, whilst some respond to the space in a fairly oblique fashion others could never be used in other circumstances as they have been designed to fit exactly into the architecture of the building. Descending the steep stone staircase that leads to the basement you first encounter the work of WalkerHill casting a golden glow from its frame. Upon closer inspection it transpires that the lighter patches are created through the painstaking process of peeling away the surface of the textured paper, creating intricate geometric patterns. The rear half of the building is naturally the darkest area, and so it is for this reason that the choice of works in here are all quite subtle in their composition as well as in how much light they emit. 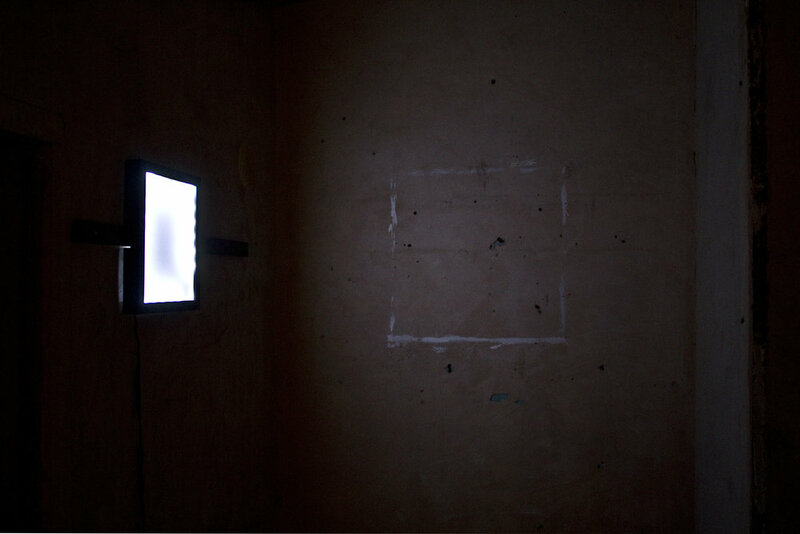 To the left a slender slice of light is propped against an alcove wall in a battleship grey wooden casing. 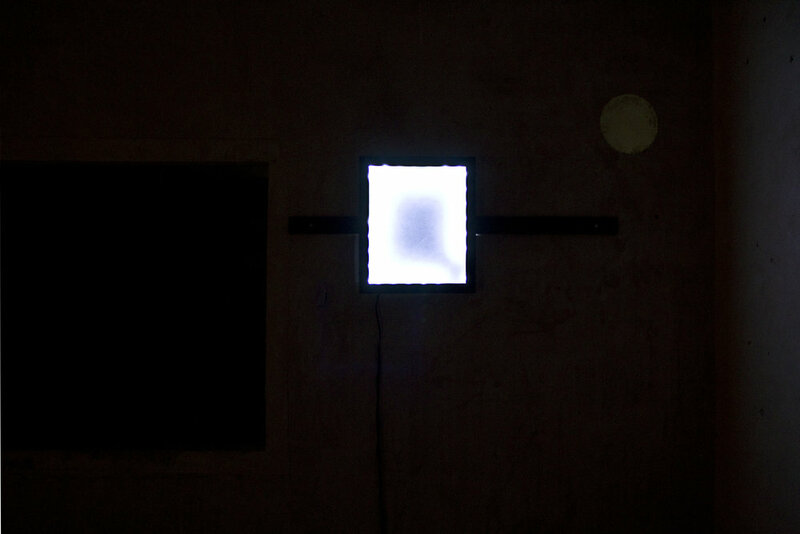 Beginning with a blue colour at floor level and moving through shades of violet at the mid-point into white, the work of Hanz Hancock utilises small sections of white tube found discarded in public places to create this 3-dimensional work lurking in a chopped out chimney breast. Along the back wall the work moves from right to left beginning with Charley Peters ’99 Drawings’ and ’99 Drawings +1’. Here a cube repeatedly dismantles and re-makes itself on an I-mac screen stood on a plinth in a recess. The work has a certain quality to it that brings to mind early animations on the ZX Spectrum and the manner of its presentation is perfectly in keeping with its surroundings. The second of the three digital pieces along the back wall could very easily be missed by those not paying attention this would be quite appropriate in relation to the nature of ‘Order Disruption’ by Giulia Ricci. An I-pad mini held in place by its skin and a disused gas pipe emerging from the ceiling has a looping animation of about three minutes in length. Only when your eyes adjust to the minute patterns that fill the screen do you start to see what is happening as the boundaries of the cells shift creating growing outbreaks of disorder in what was a uniform pattern at the outset. Moving left into the void beneath the stairs ‘Goodbye Ploy’ a digital work by Patrick Morrissey is projected onto the brick surface of the wall. Despite the clean nature of the lines and patterns in the piece itself, they are broken up and fractured by the texture of the wall, merging with the brickwork beneath. For some, such visual disturbances are too much but for those who can break through the barrier the reward is a captivating sequence of animations that seem to emerge from the every fabric of the house and its history. Moving into the front of the house the lighting becomes more intense. Directly ahead sits the sculpture of Ben Woodeson, balanced precariously; a thin sheet of brass curved upwards and held in place with a piece of black cord, a thin strip of neon pierces upwards from the floor and is balanced against the cord, underneath two books stop it from rolling in either direction. Moving left and the most site-specific work on display constructed by Sarah Sparkes sits embedded in what was a hole in the chimneybreast. Now the hole appears to go on forever as a sparkling array of red LED lights twinkle and sparkle into infinity, seemingly disappearing into what we know must be next door’s basement space. Moving left again and the work of Andy Wickes, a frame, empty bar a number of white LED’s and shot through by a bar made from the same wood as the frame itself, calls attention to its surroundings, echoing the strange serving hatch type aperture in the wall to its left and the empty square of white paint left behind from a previous project by painter Philip Gurrey. Finally John Workman’s assemblage of found material is hung with wire from the ceiling. 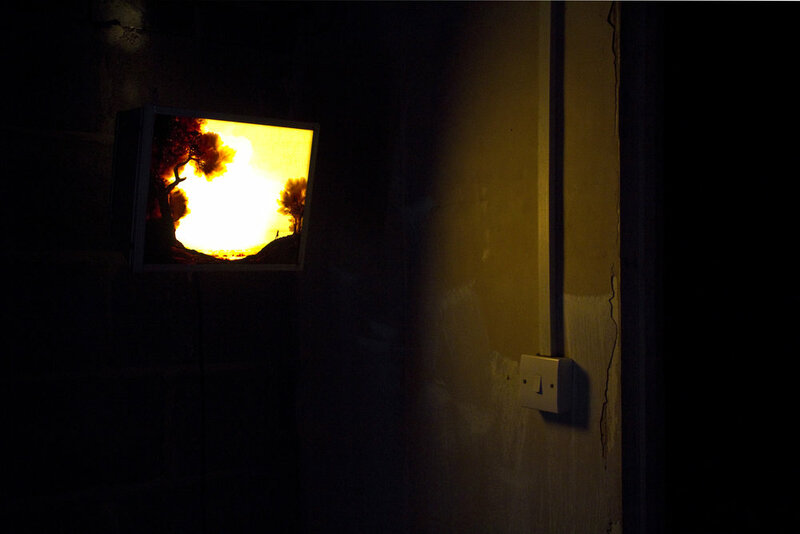 A metal container turned into a lightbox containing a somewhat romantic image of a lone figure on a wooded hillside. Whilst Workman’s piece very much contains it’s own narrative it also sits easily in with this collection of artworks and points to it’s environment as integral to its display. Looking to the right of the work, beyond the frame of the doorway that it is hung next to, the shapes of the hillside and dominant colours of the image seem to be echoed in the crumbling plaster and low wattage bulb of the stairwell that will take you back upstairs to the kitchen.